As an interior designer, one of my favorite design projects has always been decorating tabletops for dinner parties and other entertaining in the homes of my clients as well as at my own home. I have found that a well-appointed tabletop rife with magnificent elements not only makes for a beautiful focal point, but will also turn a simple place to dine into a setting of luxury. A stunning tabletop display changes an otherwise ordinary dining experience into something friends and family will appreciate and admire. Whether you choose an elegant presentation with a theme of dazzling white and gold, or a down-to-earth style showcasing natural shades of green and blue, you can create a sophisticated ambiance for a daytime brunch or evening soiree. I recommend tabletop designs that hold to well-thought plans and harmonized arrangements, but simultaneously boast flexible and creative gatherings of flatware, cutlery, dishware, and of course, stem- and other glassware. Luxurious and well-pressed table linens; unexpected and original table accessories; and breath-taking centerpieces will unify and complete your tabletop designs. Mixing and matching contemporary with vintage pieces adds contrast and creates an inventive display. For a small luncheon I hosted, the tabletop incorporated antique white chargers rimmed with silver edges, on which I placed subtle white china plates. Neatly upon each plate, I rested a pressed snow-white linen napkin held by a silver napkin ring, the set of which I had found at a beloved bazaar. For one of my client’s recent tabletop designs, I paired her heirloom rose china with brand new crystal mini-vases, each with a single red rose. The tabletop possibilities are only limited by the degree of imagination. Creating happy memories in our homes is essential; and for me, it all begins with a passion for arranging the perfect decor. This thinking should be extended to your tables, evoking practical function artfully punctuated with attractive form. When choosing the elements for a spectacular tabletop design, there are near-countless options from which to select. Here are just a few of my favorite tabletop components suggested for your next dinner party or simply to add panache and appeal to your kitchen or dining room. This simple yet stunning Mother of Pearl Design Placemat was designed by Saro and can be used as the only placemat for the table, or it can be layered with a secondary placemat like this geometric patterned one. Bold, symmetrical and even asymmetrical patterns are very stylish this year and add a little excitement to the table. I sometimes use the Bora Bora Placemat for servings of dessert and coffee, afternoon tea or when hosting casual suppers for close friends. I love these little matte silver coasters by Studio A because they add elegance to any dining table. The Abbey pattern is cast into the base of the coaster caddy which is finished in antique nickel. The caddy holds six satin nickel coasters lined top and bottom with cork. Using a coaster as part of each guest’s place setting is a nice idea because doing so protects your delicate linens or wood tabletop from any unwanted moisture. Plus, the Abbey Coasters’ silver accent can be used to highlight other silver items on the table and yield a sense of regal charm. These Glass Ribbed Candleholders by Global Views are particularly exceptional because they are made of mouth-blown glass that is formed in a steel mold by artisan glass blowers in Portugal. These gorgeous candle holders are unassuming enough in their design to make a subtle statement, yet their baluster-style stands will shine and shimmer, reflecting the light of your candles. I’ve always appreciated white dinnerware, especially this Jacqueline Dinnerware by Saro because of the elegant, crisp look it portrays and the immeasurable options it provides. The handles on the delicate, porcelain cups and the uneven edges of the plates and bowls create a vintage, old-fashioned feel, which could be paired with contemporary silverware to create an essence of contrast or refined simplicity. A pre-dinner cheese serving generates a feeling of anticipation for what is to follow, and satisfies guests while you place the finishing touches on your dinner’s preparation. A treasured set of mine, Knotted Cheese Cutlery by Saro, is the perfect combination of brass and steel. The two different metals can add distinction to your table and create a lively look that softens a sometimes too-formal design approach. Like this amazing contrast of gold and silver hues, decor items that are opposites can create a sense of interest. And, for those who just would rather not pair silver and gold, your are in luck. The set is also available in stainless steel silver alone. When I provide interior design services for clients involving dining tables and other tabletop planning, I like to fashion at least a small portion of whimsy. This set of 5 Knotted Design Flatware by Saro is fabulous because, just like the Knotted Cheese Cutlery, one option is flatware in a beautiful combination of brass and steel. But, it is the exquisite knots on the ends that give this special flatware an undeniably awe-inspiring look your guests will find quaint and dear. According to my friends at Global Views, the only thing better than a classic black and white marble tray is a classic marble tray in high heels! I couldn’t agree more. This white Quintessential Tray sits on decorative brass feet, which could be corresponded nicely with the current trends of brass napkin holders, candlesticks, or small brass objects or accents of artistic merit suited for a table. I often use Global Views’ Quintessential Tray in square, though it also is offered in round. Try using the square tray as your table’s center piece topped with a bowl of peonies or your favorite cut flowers. Or, select the round tray as the foundation for serving after-dinner port, sherry, or brandy in small, antique crystal glasses. 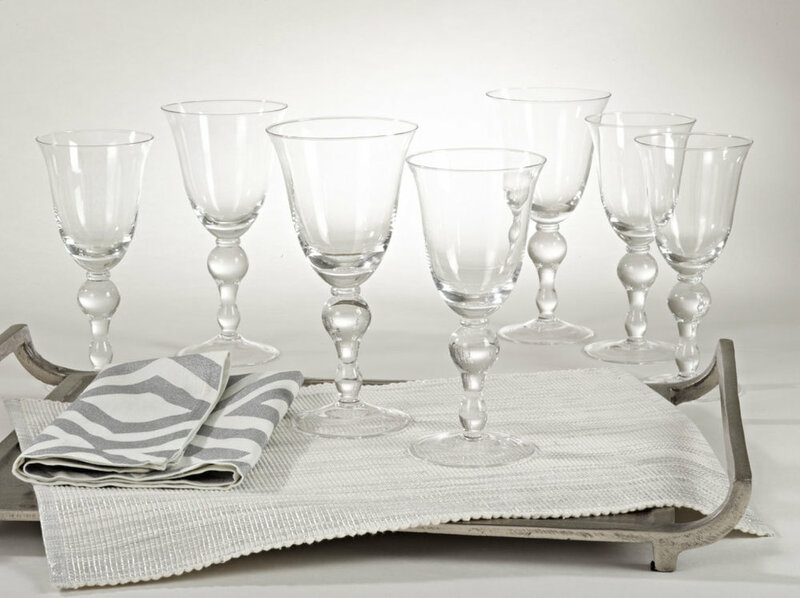 I really admire these classic Verona Wine Glasses which can be used for special dinner parties or everyday entertaining. Serving wine prior to and during dinner is almost always an essential way to prepare or engage the palate for your guests. These wine glasses, with their slightly out-turned rims and decorative balled stems, add an intrinsic quality to the already pleasant activity of entertaining those you enjoy. Last, but not least, extravagant, multi-colored flower arrangements have always been my absolute favorite center pieces for most any kind of dinner party, whether it be an outdoor fall garden party or perhaps Thanksgiving dinner with loved ones. Instead of just placing one flower arrangement in the center of the table, the talented people at Garden District have created a table runner of exquisite, radiant flowers, so each guest can enjoy his or her own personal, stunning bouquet. This photo is a superb example. Notice the harmonious green napkins, each having been accompanied by a single flower stem inspired by the extended runner-style centerpiece. I usually prefer my decorative displays to be bursting with several different types and colors of lavish florals, while at the same time, remaining low enough to keep guests’ lines of vision clear. The photo above shows a display from my own kitchen table with pink and purple flowers, accented with a hint of blue. A cherished set of crystal stemware was selected for the table. Its purple-blue etched floral design effortlessly unites the flowers with the tableware in a delicate and chic style. I adore planning tabletops that feature fresh and exotic flowers throughout my home and for adding colorful beauty to the tabletops of my clients. With dazzling and delightful ideas and assets like these, it is easy to create a one-of-a-kind, sensational tabletop that will surely impress your guests. For all of your tabletop display needs, or when you begin to plan your upcoming fall season entertaining, please contact me. I would love to help you bring your tabletop ideas to life.